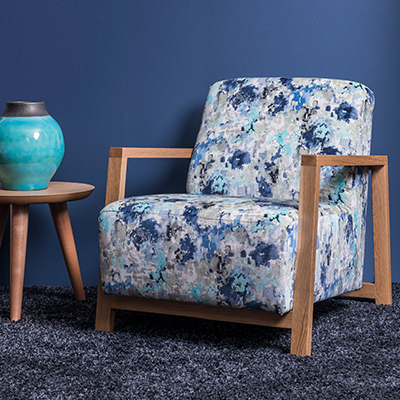 Customising furniture with patterned fabric is a popular choice with many of our customers – it delivers a singular final piece that is distinctive and personal. There are some important factors to consider first. To start with, we recommend you invest in at least one extra pattern repeat per seat (2 for 2 seaters etc) and also one extra for the seat back. Any price list you will see will be based on covering a chair in plain fabric. It’s here that customers occasionally forget that they’re not buying for something that can only be viewed from one angle (it’s not wallpaper, after all). Instead, a pattern must be shaped around a three dimensional object. Which means carefully aligning the fabric for the best visual result. When you invest in quality you want to enjoy it in the decades to come. Pattern matching will ensure everything looks great from every angle no matter what the design of the fabric and the size of the furniture. If you’re unsure, just let us know what fabric you are thinking of using. We can then tell you how much you’re likely to need. It also pays to know that textile houses cut by measurement, not by pattern. So the cut you order won’t always begin at the ‘top’. Again, we can deliver further guidance according to your requirements.